The headline-grabbing capacity of three whole terabytes is what really makes this Western Digital Caviar Green HDD stand out, but is there anything more to it than sheer size? With the focus squarely on the burgeoning SSD market it would be all too easy to overlook spinning platter drives. They're not as fast, not as talked about and not as exciting as their solid state brethren. Ignoring them completely would be foolish though, as in most cases you'll need a large hard drive to go alongside your sprightly, but slim, SSD. Plus, traditional hard drives can still offer a surprising amount of performance for your cash too. 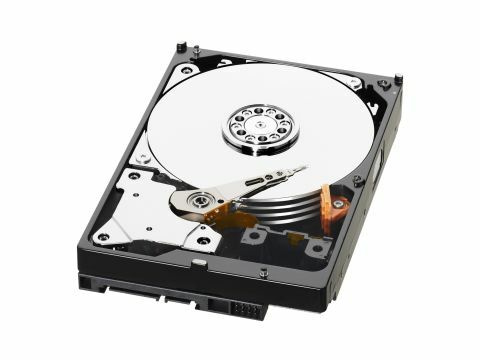 And as far as cash is concerned, traditional hard drives are still in a completely different league to their newer siblings – thanks to the enormous capacities that are available. Western Digital lays claim to a number of technologies that are driving platter-based mechanisms forward, culminating in this whopping 3TB drive. That's three terabytes in a single drive. This huge capacity doesn't come without problems of its own (more on this in a second), but it isn't the only piece of cunning technology at work to make the WD30EZRS an interesting proposition. For instance, alongside the hefty capacity, you'll find a tasty 64MB buffer, for improved performance across the board. Plus, Western Digital has employed various Cool and quiet technologies to keep the drive temperature down and noise levels to near-whisper quiet levels. his means that its got an eye on your power consumption – essentially spinning the four 750GB platters at 5,400rpm speeds as opposed to the more traditional 7,200rpm models. Optimisations ensure that data transfers don't get too sluggish in normal operation, but those looking for the ultimate in performance should wait for the release of the 'Black' edition, which forgoes the planet in preference to some good old fashioned naked performance. The main problem for the Caviar Green 3TB is down to the BIOS in your motherboard. This isn't something that Western Digital has direct control over, but it is something that it has gone out of its way to resolve. Those in the know will be aware of the 32-bit limit present in the BIOS that prevents most motherboards from seeing drive capacities above 2.19TB. While Western Digital could have just marketed this drive to owners of compatible motherboards, chances are they would have sold in single figures if they had done so. It's rather cunning solution is to bundle the drive with a PCI-Express controller card that enables everyone (with a spare PCI-e slot at least) to get in on the high-capacity action.